The 426 Michigan Avenue project is a strategic, integrated campus designed to offer “one-stop” medical care for patients. Located on Michigan Avenue’s Medical Mile in Grand Rapids, it is just a few blocks from Spectrum Health’s downtown hospital campus. 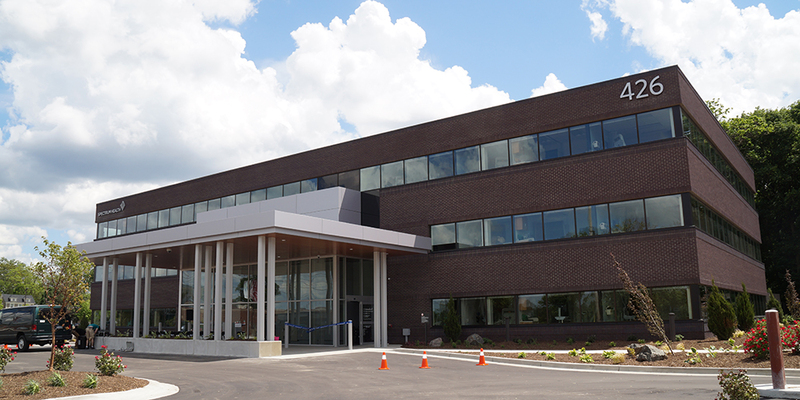 The project comprised the complete renovation of a three-story, 30-year-old building to develop a state-of-the-art medical office building with diagnostic and treatment services and equipment in one location. The interior was completely gutted, removing all mechanical, electrical and architectural materials to return the building back to a core and shell configuration. The first floor contains a new main lobby/reception area and waiting room, one radiology/X-ray room, two future radiology rooms to be built out at a later date, four blood draw rooms and a lab processing room, 12 exam rooms and one alcohol screening room. The second and third floors consist of 28 exam rooms and two large team work rooms each, with the third floor specifically serving pediatric patients. Granger also constructed a new drop-off canopy and vestibule at the main entrance that includes a decorative metal panel ceiling with a wood grained finish. Work also included staining the brick façade to reflect Spectrum Health branding, installing all new exterior glass, new sidewalks with snowmelt systems, a new brick patio and landscaping, all new MEP systems, a new roof and new asphalt for the parking lot. This project was finished on time and within budget.